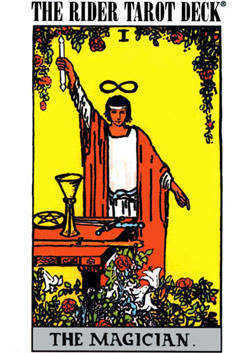 A feeling of imbalance and negativity prevails. 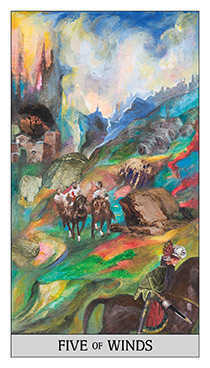 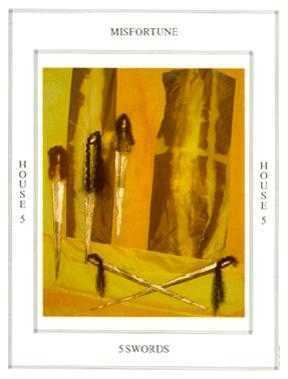 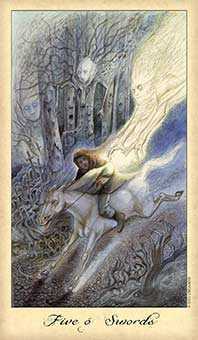 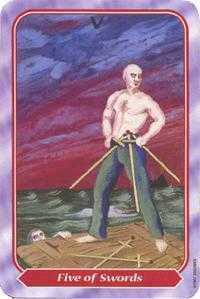 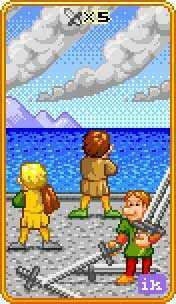 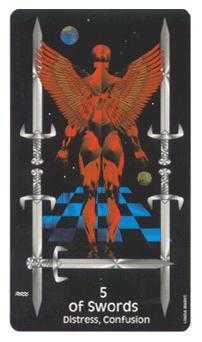 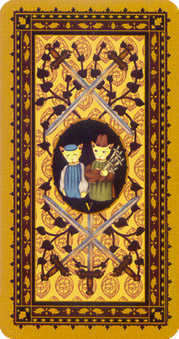 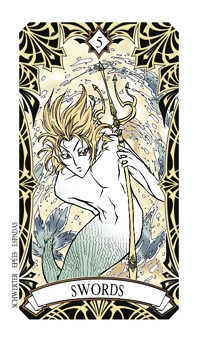 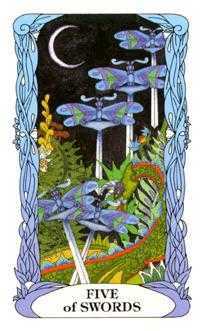 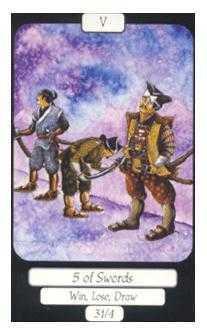 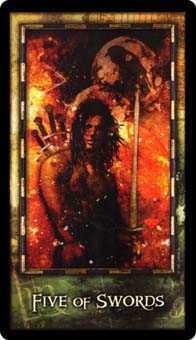 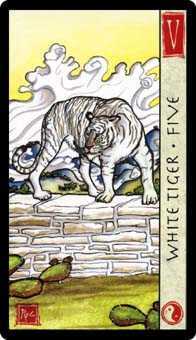 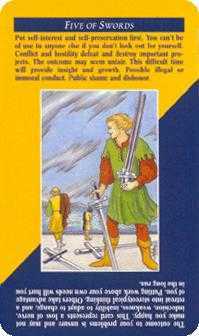 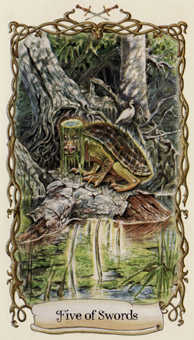 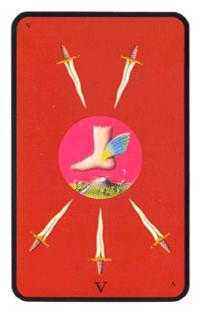 Rider Waite deck © U.S. Games Systems, Inc. 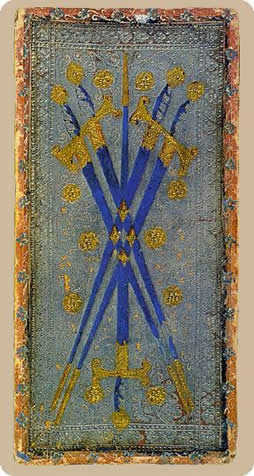 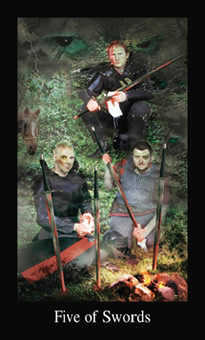 Traditionally, the Five of this suit references the grim and sobering process of cleaning up the battlefield after a conflict. 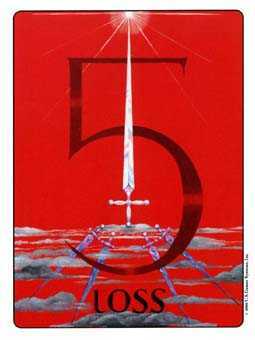 The war as a whole has not been won or lost yet, but in this skirmish there were grievous casualties. 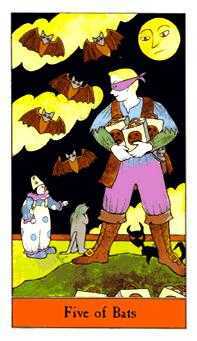 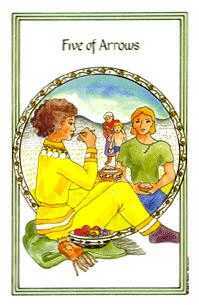 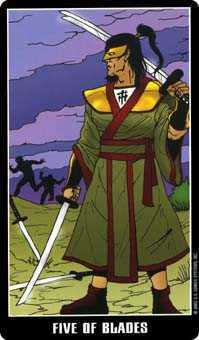 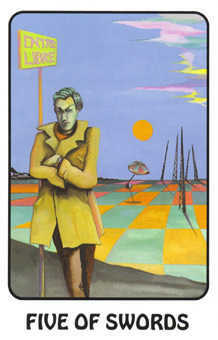 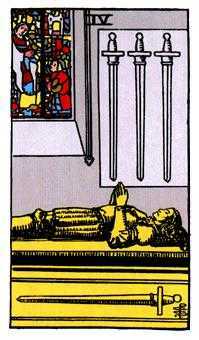 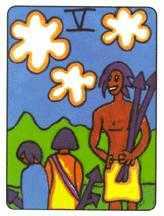 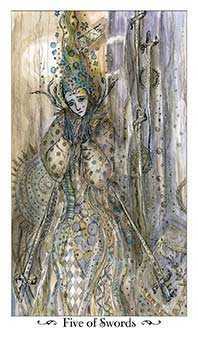 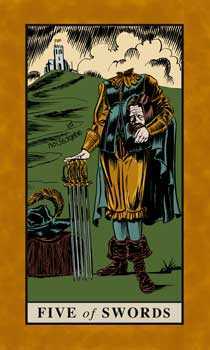 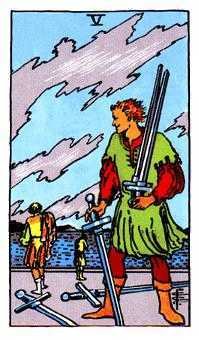 This card admonishes the loser to study carefully what went wrong, so that a new strategy can be devised and more setbacks forestalled. 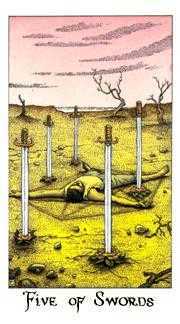 There is a need to regroup and rethink the game plan, discover your blind spots and weak links, and take corrective measures before getting back into the field for another round. 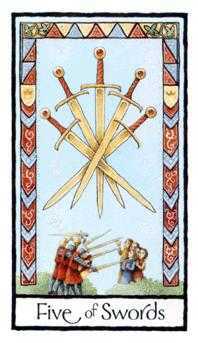 In these modern times, when the battle is more often being waged with words, laws and contracts instead of weapons, we have even more reason to examine our approach, our style, strengths and weaknesses. 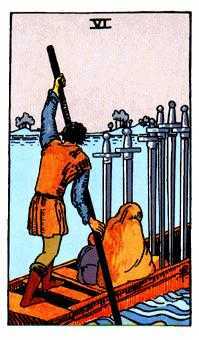 If we have underdeveloped communication skills or lose our objectivity in tense moments, our ability to reach our goals and dreams will decline. 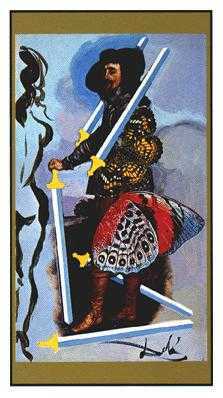 But, if we avoid letting ourselves be haunted by the misfortunes and detours that inevitably befall us, we will go on to achieve those goals. 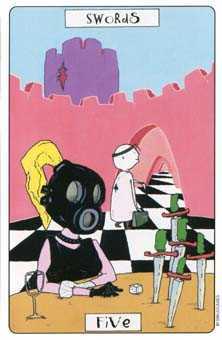 Do not obsess. 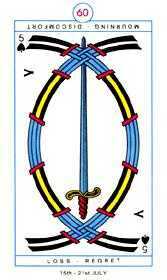 Try to learn something. 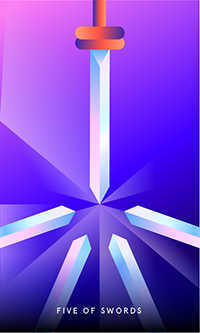 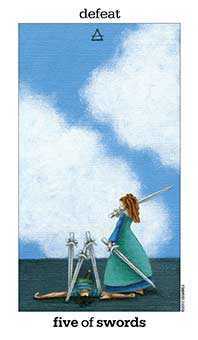 Challenge the pessimism of others around you by evoking their higher nature. 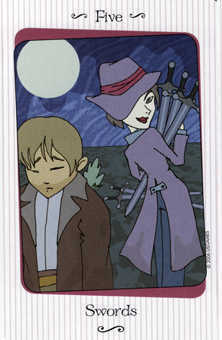 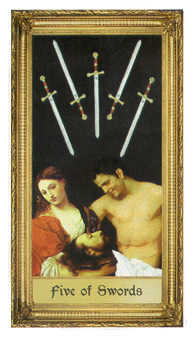 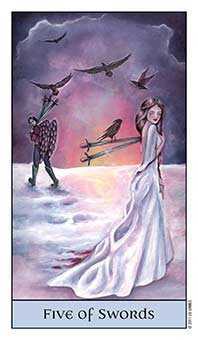 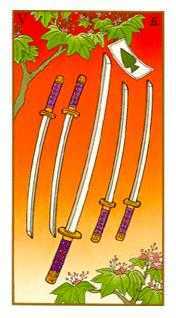 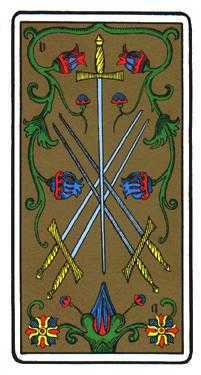 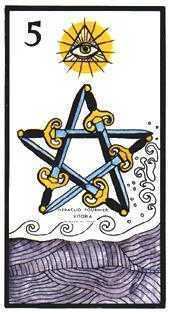 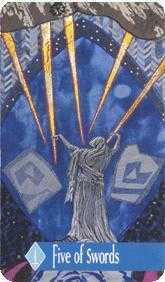 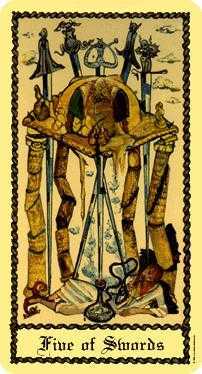 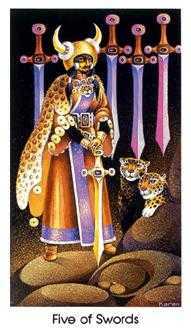 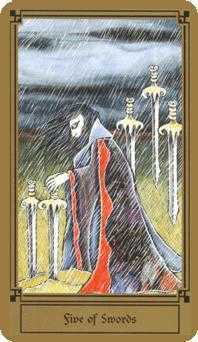 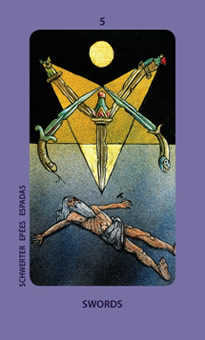 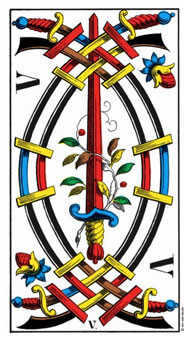 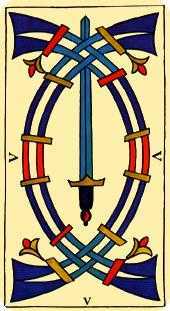 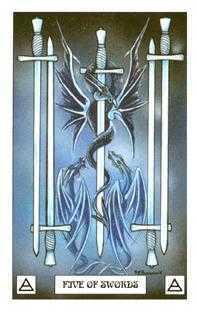 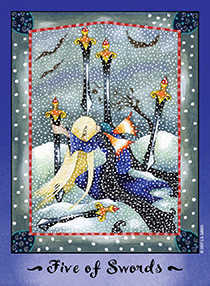 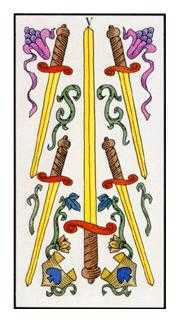 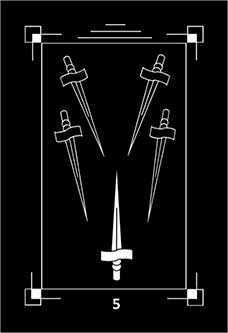 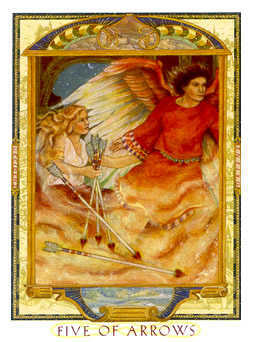 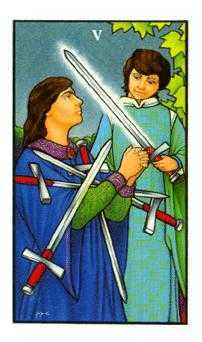 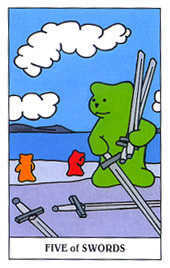 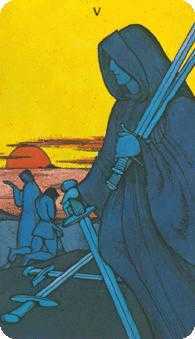 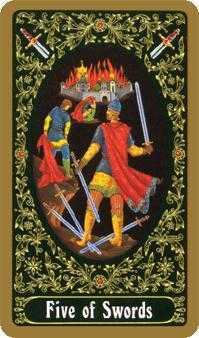 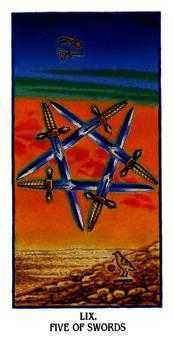 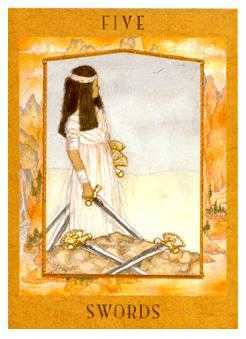 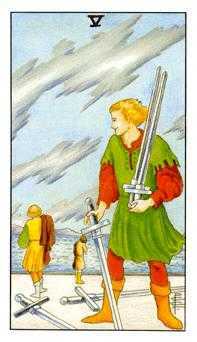 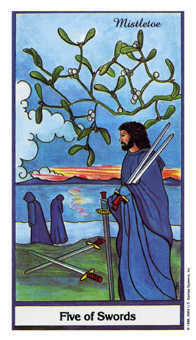 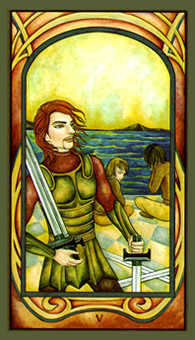 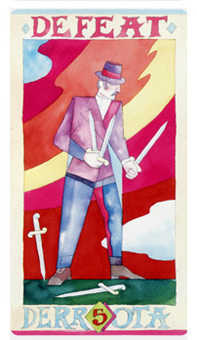 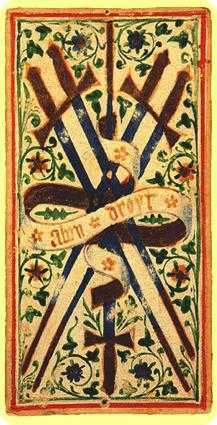 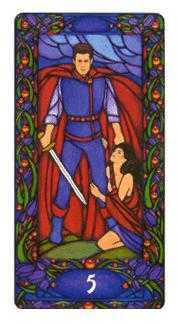 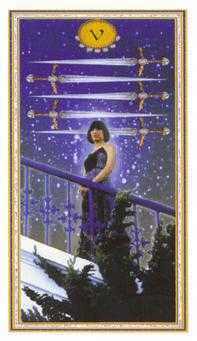 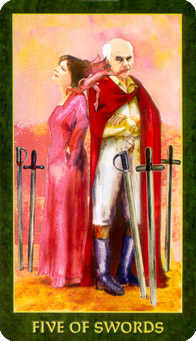 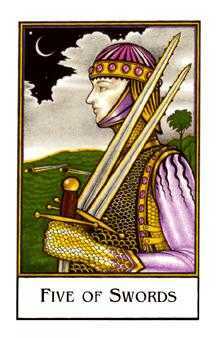 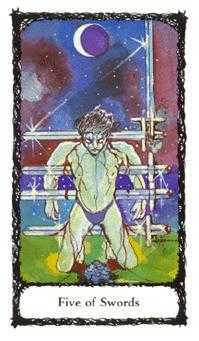 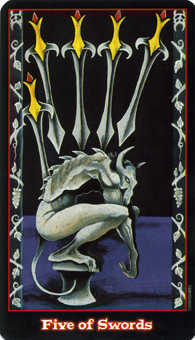 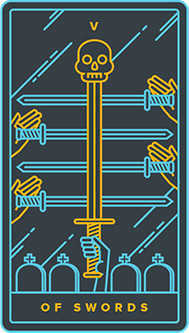 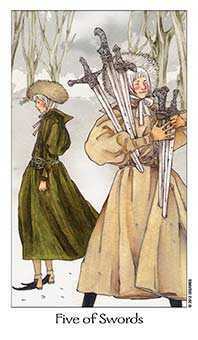 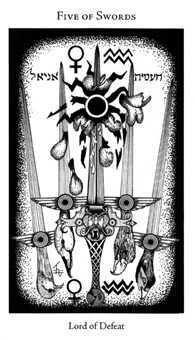 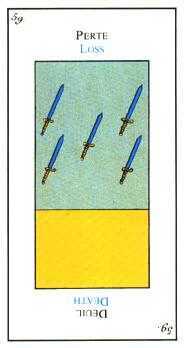 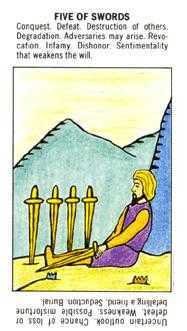 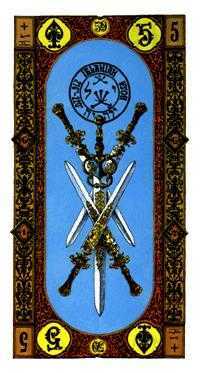 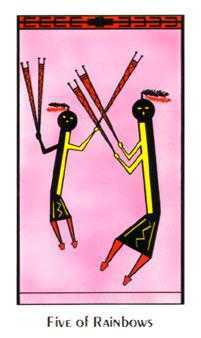 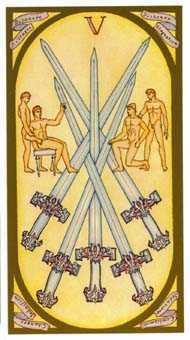 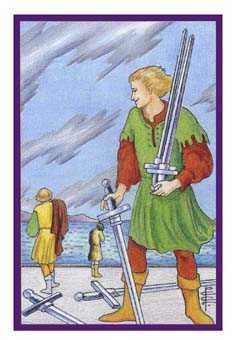 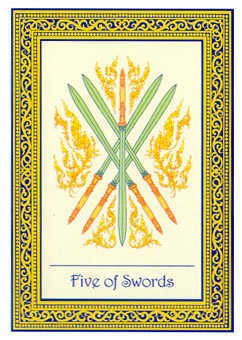 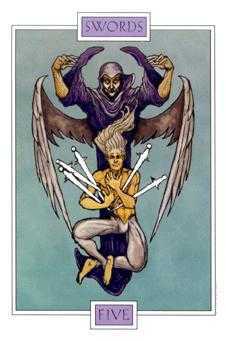 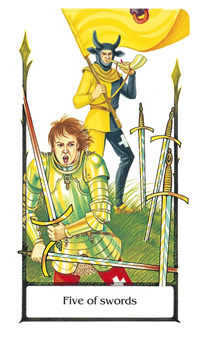 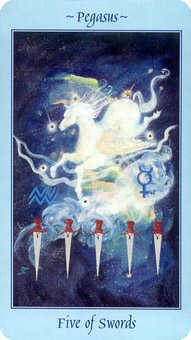 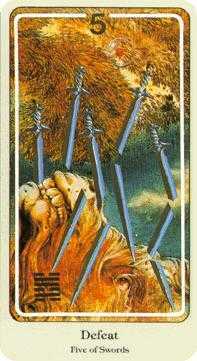 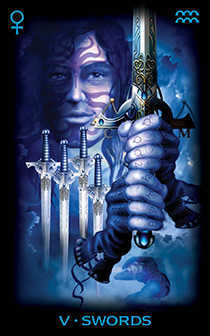 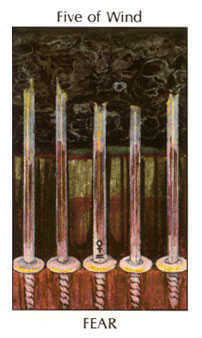 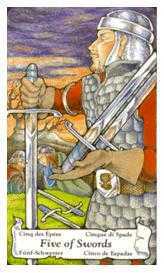 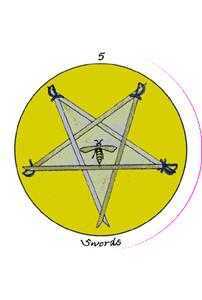 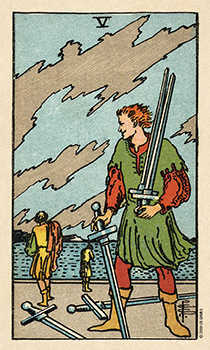 The Five of Swords in this position advises you to prepare yourself for disappointment over how your fellow humans are setting their priorities. 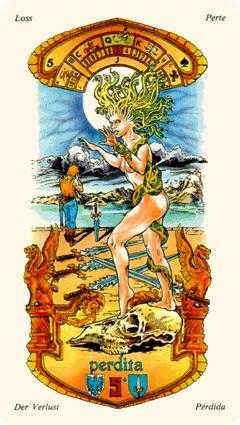 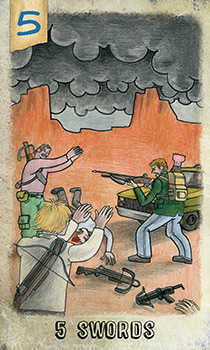 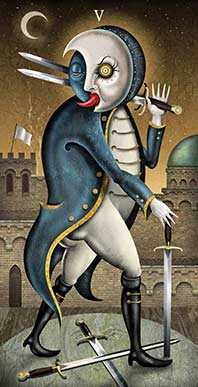 It seems that the lower end of human nature may be eroding good will in the current situation. 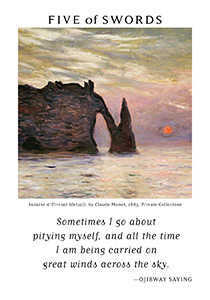 Due to a strong cultural trend toward scarcity thinking, a "me first" outlook prevails. 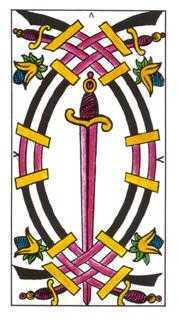 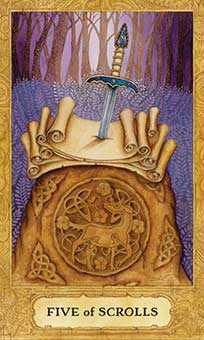 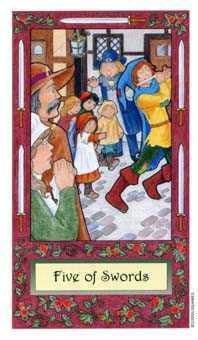 If this means that you need to develop a thick skin or carry your sword of truth closer, then do so. 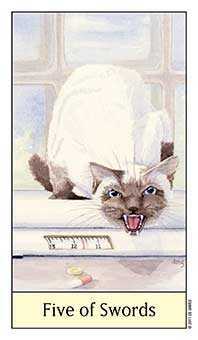 Try not to be too quick to anger or jump to conclusions. 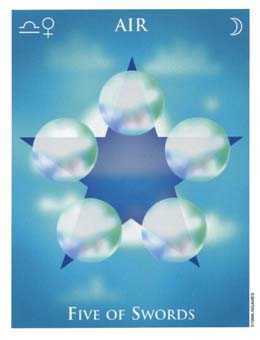 Just because others may have a pessimistic sense of the world, their reality does not have to undermine yours. 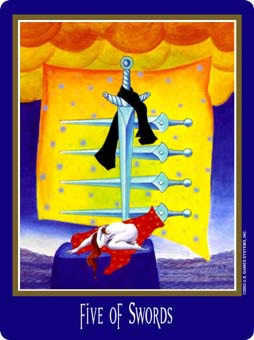 There is certainly no point in struggling or competing with them. 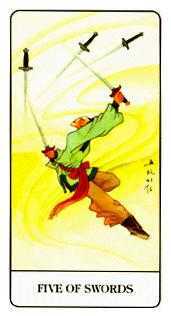 Your challenge now is to learn how to sidestep confrontation and evoke a more evolved response from people. 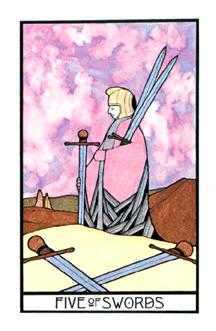 At the very least, be assertive about setting boundaries for yourself.